The world's innovation economy is broken. If you have an idea, depending on who you are or where you live, you might never get a shot. A handful of people in a handful of cities are deciding, behind closed doors, which entrepreneurs get a shot to succeed. The determining factor? Potential profit. We're living in a world where we are struggling to feed, provide energy, and provide quality jobs for a growing population, yet the innovation economy continues to prioritize investing billions in photo-sharing apps and on-demand food delivery services. The result is a system that doesn't support most entrepreneurs-entrepreneurial activity is at a 30-year low-and a system that doesn't work for investors. 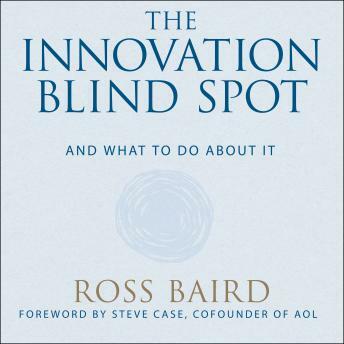 In The Innovation Blind Spot, venture capitalist Ross Baird demonstrates how to fix the problem by helping us find better ideas, looking at people, places, and industries often overlooked. Baird also explores 'one-pocket thinking,' which ensures ideas are not just benefiting a few people from the top down, but broadly benefiting entrepreneurs, business, and society from the bottom up. Ross's firm, Village Capital, is at the vanguard of a new way to finding ideas that is much more democratic and inclusive, and his method promises to dramatically increase success for everyone involved.